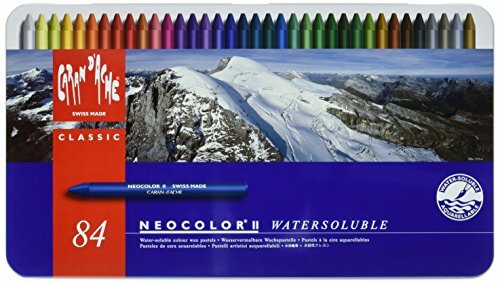 Add luminous color to your artwork with this 84-piece assortment of Neocolor II Water-soluble Artists' Pastels from Caran d'Ache. These superior-quality artists' pastels meet the exacting requirements of fine artists, illustrators, graphic artists and teachers. Use these soft, water-soluble pastels to create beautiful watercolor effects. Simply make a sketch with Neocolor II pastels, then sprinkle it with water and allow the colors to dilute. Use a brush to pick up colors and paint as though with watercolors. You can also draw on moistened paper for a wash and varnish effect. Neocolor II Artists' Pastels have a high pigment concentration that results in bright, opaque colors, suitable for many techniques on dry or wet paper. Neocolor II water-soluble wax pastels are a product of Caran d'Ache innovation. They combine the expertise of a color specialist with the great ''Swiss Made'' tradition. Neocolor II wax pastels are exceptional, both for their quality and the techniques they make possible. Neocolor provides inspiration and opportunity for all professional and amateur artists to fully express their talent and imagination. Set is packaged in a metal tin. Conforms to EM-71 (CE) and ASTM D4236 safety standards, suitable use in for U.S. schools. Caran d'Ache products are ideal for sketching, figure drawing, and portraits. Caran d'Ache uses high-quality pigments for colorfastness and excellent lightfastness. For over 80 years, Caran d'Ache has inspired amateur and professional artists, providing top quality pastels, pencils, paints, brushes and more.